324 customers have given this product a 5-star rating. 118 customers have given this product a 4-star rating. The RTA Producer workstation is a big heavy and very good value for money studios workstation. It is very heavy and is well packed for delivery. Tons of rack space, great sized work surfaces and practicality for lots of different kit. I added 3 x 4U and 1 x 2U Thon lockable rack drawers to mine, which gives excellent storage for cables, mics etc. The sliding keyboard and laptop shelves are sturdy and smooth. Cable management is made easy with various rubber grommets, cutouts and a rear tray. Heavy duty wheels with the two front wheels able to be locked to prevent it moving around when you don't want it to. It has 16 spaces for CD storage but personally I won't use these. The only disappointing thing I have found is that the rackmount screw holes didn't perfectly line up with the mounting holes on the drawers and rack gear I have when trying to install them without gaps between. They had to be fitted with gaps between each piece of gear and I found the gaps are not evenly spaced, some gaps are bigger than others. This problem has been mentioned in several reviews and I think the manufacturer needs to consider altering the design to correct this. It would perfect a great bit of kit if they fix this issue, though it's not so bad that I am unhappy overall. For the cost of this you will struggle, as I did, to find anything else that even comes close to the design, quality and features it offers. It is robust, functional and looks great in my home studio. I'm very happy with the product and would highly recommend this over a cheap and flimsy, or really overpriced and expensive workstation. I knocked one star off because of the problem with the rack mounts not lining up without gaps but I would still highly recommend the product. I'm sure it will give me years of service! Amazing but beware of what you're buying. For me this desk was great especially for the price. Now I own a few racks mostly my audio interface (2U) and a rack mount tape recorder (3U). So I built up my desk and when it came to fitting my rack equipment it wasn't the easiest or the best solution. My audio interface is only held in by 3 out of 4 screws as one of the holes in the rack mounting shelf is off which seems to be common on all of the rack railing on this desk. The same with my tape rack but only 2 out of 4 screws will fit. So my advice would be if you are looking for a big desk to hold all your keyboards, drum machines, basically anything thats not rack mounted buy this desk. However if you own a lot of rack equipment this desk might be a big disappointment and good luck sending it back as you have to tear the box open, plus it weighs a ton and is delivered on a pallet in two separate boxes on a wagon. So think first. Now I love this desk it fits everything i own on it including my macbook pro, my MPC, my keyboards and synths, my 2 two racks, my turntable, my Markbass amp head and 2x10 cab, my Fender Blues Jnr, my drums, studio monitors and whatever else with room to spare. The upper shelf also places the studio monitors at a great height for recording and mixing. 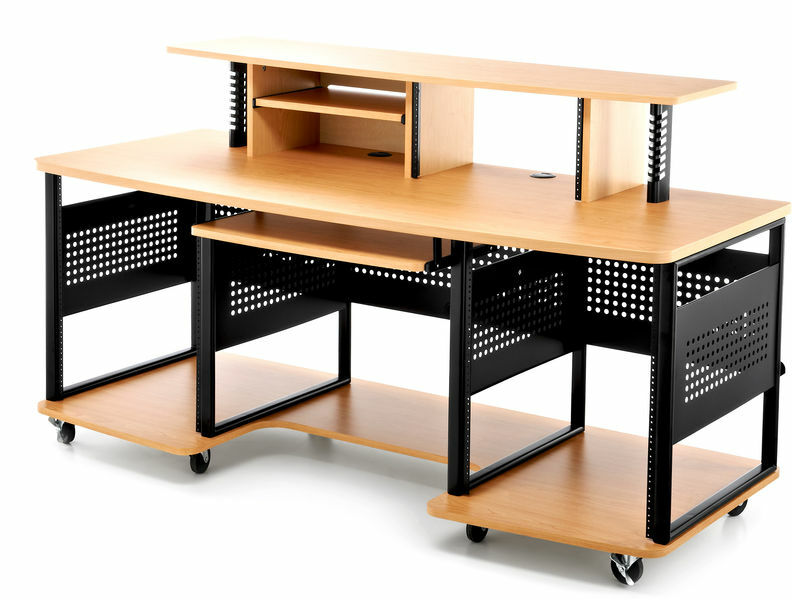 So if you are a digital musician with just a few racks but mostly hardware for table tops, get this desk. But if you want this desk for studio racks look for something else as from most reviews this is a common problem. ID: 177479 © 1996–2019 Thomann GmbH Thomann loves you, because you rock!